Tada! How do you like the new look of my blog? I have to say I love it and find myself staring at it for no reason! lol I hope you'll enjoy it too! Special thanks to my crafty friend and design team mate, Michelle of Evermore Card Creations, for her talent and expertise in making my vision a reality! And now for my first post post-facelift! It's time for a new challenge at KennyK's Krafty Krew! Want a chance to win some KennyK images? Then join us for our newest Anything Goes with a Twist challenge! The twist for challenge #167 is one of my favorite embellishments: Gems/Rhinestones!!! Check out the Krew's dazzling creations and play along for your chance to win! Our random winner gets 3 digis of choice (5 if you use the optional twist in your project) and each of our Top 3 picks will receive 1 digi each for the honor! There's also a special blog candy for the month of March! 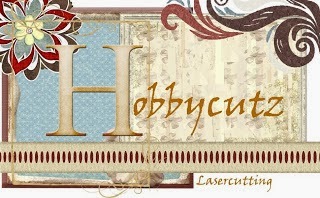 Enter and you could win fabulous prizes from Loves Rubber Stamps ($10 Gift Voucher) & HobbyCutz (£10.00 voucher)! I've used one of the new Glam Gang images. This is Fabby Farah. 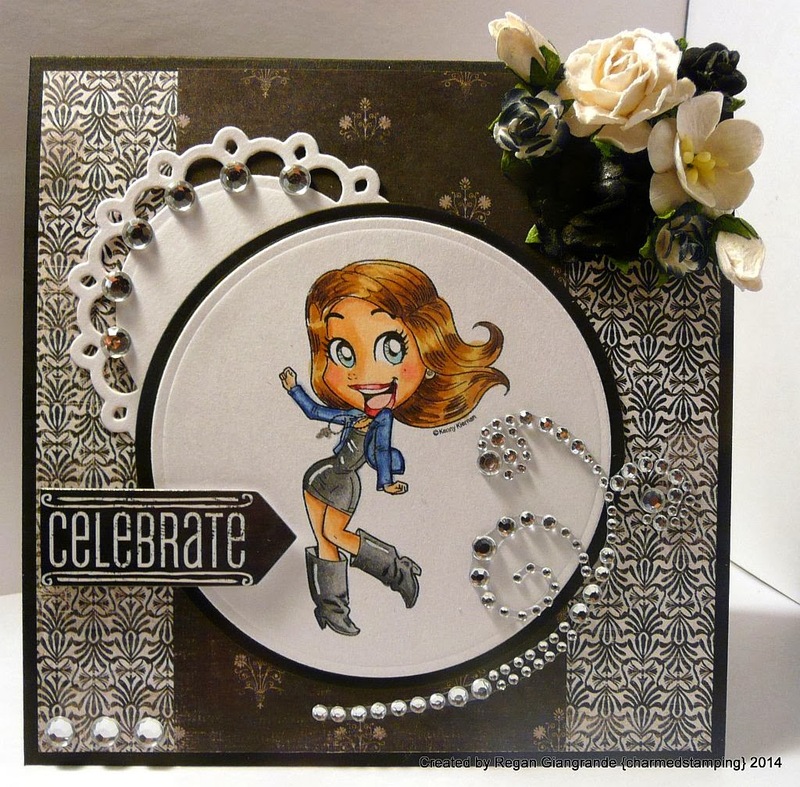 She's colored with Copics and cut using the Classic Circles Nestabilities from Spellbinders. I also used the Picot Edged Circles Nestabilities from Spellbinders as well. I added flowers to one corner and, of course, clear rhinestones. The sentiment is a chalkboard chipboard sticker from Me&My Big Ideas. Papers are My Mind's Eye - Meadowlark. You MUST use a KennyK image to play along, but since they're so fun to color why not join us! What's everyone to where you are? It's bitter cold here and I hear more snow is on the way. I am planning to do some more crafting this weekend. Hopefully I will be stocked up on crafty goodies after a trip to my favorite (semi) local scrapbook store that is sadly closing. I'm going to need a little retail therapy to cheer myself up too.... This is the first day since he was born that I will go a full 24 hours plus without seeing my small man. He is off with his dad for a little mini vacation, and though I know he's having fun, my heart hurts just a little bit. Everyone keeps telling me to enjoy the "me" time (and that I'll want more of it), but I'm finding it just a little hard not to miss his little voice and all those mommy/son moments that make our time together so everyday awesome. I know I need to let go. At least a little. He's growing up and things are changing and in order to do what's best for him as his momma I need to adapt. This is just the first of many days to come, I'm sure, but it's those firsts that are the hardest, aren't they? He'll always be my little boy, no matter how big he gets. I will just have to pack my schedule full to distract me and hopefully Sunday afternoon will be here before I know! Markers used: Copics (E00, E11, E21, E23, E31, E79, N0, N2, N4, N6, N8, B34, B37, R32, R39). what a very beautiful card Regan. This looks fab!!! 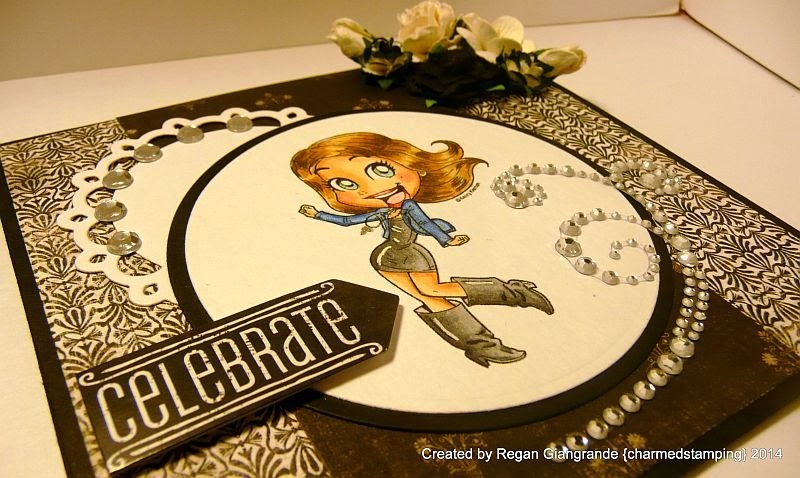 Love your rhinestone work and also great work with the sketch! Beautiful work Regan. I love the card, love the coloring and love the sketch. I also love your new blog. Beautiful design. Love the bling!! Super cute!! Thanks for joining us at Clear It Out Challenge and good luck!! Love your blog Regan! Beautiful colors. The card is gorgeous and love your coloring; as well as your DP. 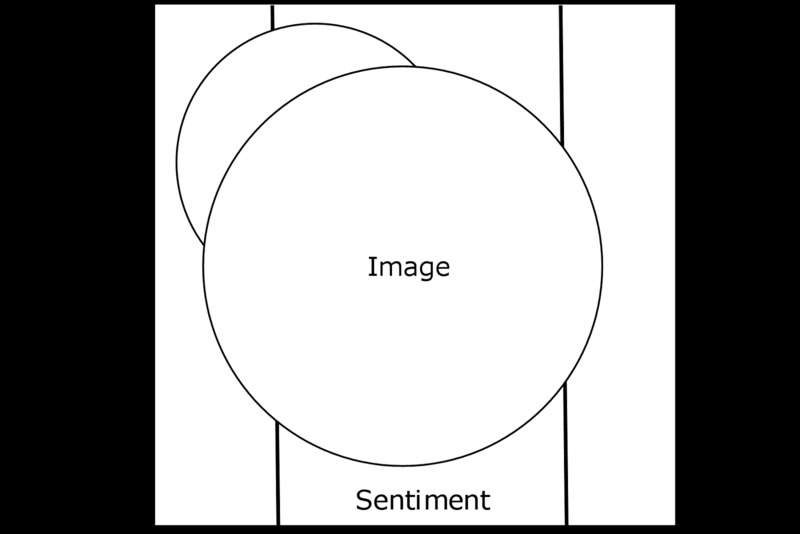 Great take on the sketch. How fun!!! Great layout and love the black/white with the pop of color with the image. Thanks for sharing with us at Digistamps4Joy. 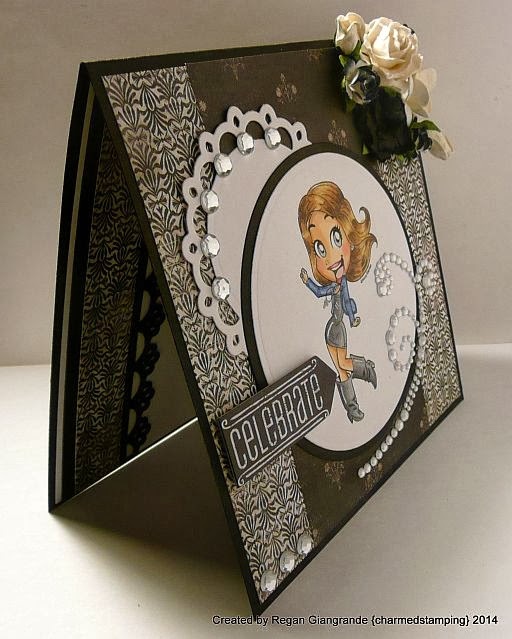 Gorgeous card - fabulous image and stunning detailing. GOrgeous, thank you for sharing with us at Scrappers Delights Challenge blog.